Even the harshest winter is always followed by spring. So if you’re going through any kind of personal “winter” in life… be it financial, relational, health or other challenges, know that this too shall pass and your spring will come. The fastest way to bring on our personal springtime, full of blossom, optimism and hope is to immerse ourselves in learning and growth. We learn, immerse, act, apply and grow. There are so many people struggling unnecessarily. We have a boomer acquaintance who—at 60—is recently retired and divorced. She often complains about being depressed and of ailing health and not having enough money, but when she’s given proven prescriptions to improve her situation, there are always reasons and excuses not too. No matter what solution is proffered, there is always a corresponding “Yeah, but”. In coaching people, I’ve observed and learned that’s a common pattern. Some clients pay their coach or therapists week after week, so they have a place to go to unload and rehash how they’ve been wronged and how they feel about it. These people won’t apply solutions if prescribed. They’re stuck in a place of wanting to complain, or at least being more comfortable complaining than they are uncomfortable with what it is they’re complaining about. Perhaps you know someone like that? See, we have to get uncomfortable enough to change. Get uncomfortable with excuses and complaints and in being the victim. When we get more uncomfortable with that state than we are with the discomfort and fear of the new and unknown, then will we be compelled to change and make progress. 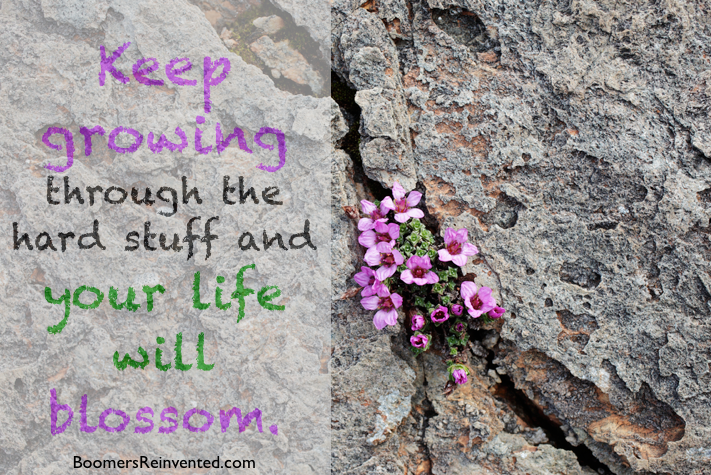 As we make progress our fears and ills fall away like the outer husks of the seed that is growing. The husks have their purpose: to protect the seed from the bumps and crashes of life until the inner kernel… the soul of the seed is ready to sprout. The sprout cannot grow and hold onto the husk at the same time. It must shed that which is old and worn out. That which has gotten us to where we are is often not that which will get us to where we need to be. In our teens and twenties, many baby boomers railed against the constraints of our parental and societal mindset that seemed fixed and rigid. But as human nature goes, we got caught up in the summer of life, vision obscured by busy-ness while we proceeded to sink into our own version of that. Don’t be the boomer stuck in the past… who says they can’t figure out today’s technology… who says “50 years ago things were so much better…” or who loses today lamenting yesterday. We are reinventing not lamenting. 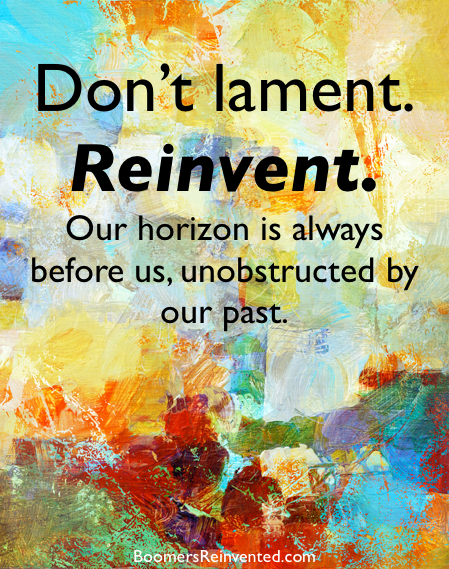 Our horizon is always before us unobstructed by our past. That can be our clue… cue to shift our mindset: whenever we find ourselves lamenting, complaining or singing an old saw, we can change it. One of my favorite ways to change mindset is to turn on some rocking music and hop on my bike and get in some vigorous hill sprints or other physical exercise. Our guest interviewee, Lorraine Ladish did this She started her own web publishing company at age 50! While Lorraine new something about the online publishing world and is a trained and talented writer, she did not know anything about search engine optimization, keywords, marketing and the social media world, all of which she had to learn about the become a web publisher. So she learned it, and today Lorraine is paid for being a spokesperson for brands and running some of their social campaigns, and is sought after as a story-teller in both the written and spoken word…and in two languages! Each new skill is learned one step at a time, and elevates us accordingly. If you’re tired of your work and want a change, facing retirement but still want to work, or needing to earn more money for greater financial freedom, you’re only one skill away from being able to do that. You’re only one skill away from your next best thing. Start now. Working in the online world, we see loads of opportunities every day and more freelance business opportunities just waiting for more good people to take it on. Right now our endeavors are growing and have so much potential for expansion that I could easily keep seven people occupied working full time, and the more we do the more opportunity we see. The more we do the more opportunities we see. Some people are earning as much as 4-6 figures per month, selling on Amazon!! Even if you don’t have a product or product idea. There are some really great courses out there for that. Here are three that I’ve vetted and some we’ve invested in. They tend to only open the course for new students once or twice a year, but you should be able to get on their waiting list if the program is already closed, and meanwhile, they may leave up the access to their free video trainings so can get an idea of the concept and what’s possible. However, if these links don’t take you to a sign up place, send me a note and I’ll send you updated info. We’ve invested in one of these programs so as to learn how to better sell our existing products on Amazon as well as having an avenue of knowledge in the pipeline for when we’re ready to expand our product lines. In today’s accessible online world, the middle men and gate keepers are dwindling. Individuals able to bring their offerings, knowledge, training, crafts, etc, directly to the end customer with increasing ease. New industries, jobs and opportunities are springing up like new growth in spring. I never wanted to learn how to sell on Amazon. I just wanted to place our My Trainer Fitness line of workout products there so people who needed them could find them. But surprise!… it doesn’t work that way. You can have the best product in the world, but if the world doesn’t know about it, it will languish under a layer of dust. So I set aside my resistance to doing what I thought I didn’t want to do and have been educating myself on best practices and strategies for selling on Amazon. And… SURPRISE!… I’m having fun doing it! I learned a lot of my own but needed more, so I investigated three top courses before investing in one. I was very surprised and impressed to learn that many people are making 5, 6 and 7 figures per month, selling on Amazon, which has freed up many to leave their full time jobs to become self-employed entrepreneurs working a fraction of the time they used while earning more money. This business model is a great fit for baby boomers. Many have more time because they’re either empty nesters or retired, and some are concerned that their retirement is not going to hold up as they thought it would. Others just want to be free to travel when and where they want. If this sounds like something you’d like to know more about, you can get more info on that here. It would be fun if others end up doing this too, then we could compare notes and support each other on the journey. Let us know what you think. We’re eager to hear of the courses you’re taking, things you’re learning, and new ventures and adventures undertaking!